We’re less than a week away from Google’s April 21st date to have our sites mobile-friendly. Hopefully, by now, your site already passes Google’s test, you’re implementing a plan to meet the deadline, or you have come to the conclusion that you’ll be okay if your website is not returned in the SERPs (search engine result pages) that are performed from mobile devices. The decision is individual. What we don’t want to do is make rash decisions that could derail our overall business strategy. We need to take a common sense approach to this and not fall prey to the #Mobilegeddon hysteria. So, what is the “Mobilegeddon” hysteria? It’s due in part to misunderstanding what will happen when this new ranking signal is rolled out. It’s also due in part to businesses that are attempting to take advantage of people who don’t have mobile friendly sites. That tweet was obviously intended to drive customers to their service by inducing fear. 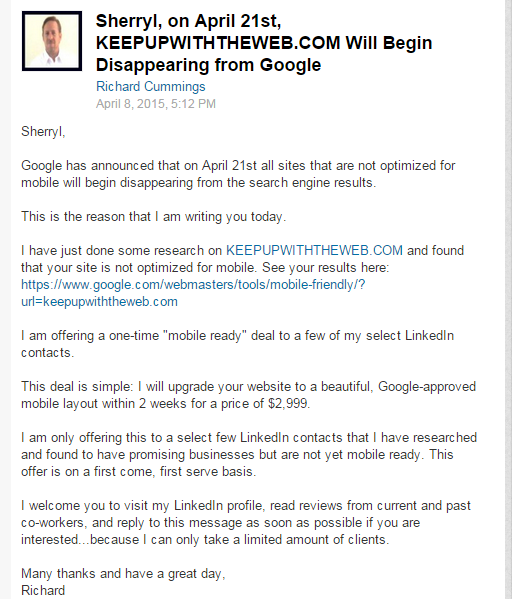 When in fact, Google will not “demote or delist you from their search results if you don’t have a mobile friendly site by April 21st”. To read a more balanced view of what actually will happen, read Mark Traphagen’s Google+ discussion in which he shares insight from Ashley Berman Hale. Richard (who is no longer a LinkedIn connection of mine) was obviously trying to take advantage of his connections by openly soliciting those of us who may be vulnerable to this sort of tactic. Seriously? Three thousand dollars for a website within 2 weeks? There are so many trusted website designers (like Leora Wenger who offers much more reasonable solutions to make your website mobile friendly). What could the root problem be that is making your website fail Google’s mobile friendly test? What if your site does pass the test? Are there still issues that would cause issues with your website? Unplayable Content:Media players such as Flash are not supported on many mobile devices. Rather than use a proprietary video player, consider using HTML5 animations or having a transcript available. Faulty Redirects: This only affects you if you are redirecting visitors to separate mobile URLs. Mobile-Only 404s: If you have Google Webmaster Tools set up and have these errors, you should receive an email notification from Google. Irrelevant Crosslinks: This only affects you if you are redirecting visitors to separate mobile URLs. Slow Mobile pages: You can determine if site speed is an issue by using Google PageSpeed Insights. Here are this week’s #FridayFinds to help you sort through some of the latest news on Google’s efforts to make the Internet more mobile friendly. What are your thoughts? Will you be paying more attention to how your site is appearing in the search results? Do you have plans to make more changes to your website this year? Did you receive any unsolicited emails from individuals trying to capitalize on #mobilegeddon? We’d love to hear from you. Having mobile friendly website is really good for everyone, this gives the user best experience and good ranking for our website in search engines. I am very fortunate that when I started my website, I chose a theme that is mobile friendly. But now, google has this Accelerated Mobile Pages and the Theme developer has no plan to adopt to this AMP Thing. I hope these theme developers adopt this initiative. That’s great that you started out with a mobile friendly theme but unfortunate that the theme developer has no plans to adopt AMP. It will be interesting to see how this all pans out. I hate it too James. I’m often surprised to find really popular blogs that don’t display properly on mobile devices. I sometimes wonder if it could be because they’re depending on a plugin to make the site responsive. In the past, I’ve run into issues where the WordPress plugin that I use doesn’t always show the mobile version. Usually, clearing my site cache fixes the issue. This is a reminder for me to check my site! I recently deactivated my caching plugin and turned on the caching feature in Wordfence. I hadn’t thought to check my site on mobile. Thanks for joining the conversation. I hope you’re having a nice weekend. It seems like again people overreacted. It is wise to make sure your sites are usable for your users. This is the most important thing, and so lots of the noise was worthwhile in getting people to go check how their users were being treated on mobile. I always checked mine and they were and are good. Google’s tool didn’t like several of them, and wanted changes to make it less useful for users but that would make Google more happy. I didn’t make the changes. 2 of those sites show maybe declines, the other 2 show maybe increases, on traffic from Google since the change (it is hard to be certain so far the changes are not huge at all). A couple of my sites that Google liked for mobile also showed slight increases in traffic from Google. None of it amounted to much of anything. It’s hard to not to react when Google makes an announcement like that. Although, we all should have known it was coming. More importantly, it is about the user experience and it is frustrating for website visitors if they can’t see our sites on their mobile devices without resizing their screen. That’s good that you haven’t noticed a sizable impact. I agree that it can be difficult to determine if a change affected your traffic or not. There are so many variables involved. As always, thanks so much for weighing in on this. It’s interesting to hear from other bloggers and I know many readers here enjoy the conversations in the comments. I hope you’re having a wonderful week! I know it has been a long time since I last commented, but saw you post in my feed. I guess I am lucky as the theme I use for both my sites is responsive design and it only takes a tick of a box. It was interesting when I tested earlier last week my new site it said it was mobile friendly but had errors. A few days later all was okay. It is interesting , whenever Google announces something major the less than professional people and companies show their true colours and try and exploit others. It’s great to see you here! I know how busy you’ve been and I totally understand. Geesh! I can’t even seem to keep up with the comments on my site let alone make the rounds as much as I should be. That’s wonderful that you launched a second site. Good luck with it! I’ve checked it out but I haven’t had a chance to comment yet. You know I will! “Show their true colours” . . . that is so true! You know that it’s working for them and that some trusting and unsuspecting person probably fell victim to one of these schemes. Can you imagine someone proposing to build a site valued at $2,999 without even having a preliminary conversation with me? This is a very simple site! While I chose to use a WordPress plugin rather than switch my theme (for now), I could have simply switched to the default (and free) Twenty Fifteen theme and accomplished what he promised me. It’s buyer beware for sure. Thanks for joining the conversation. It’s always nice to see your smiling face. I have been expecting this. I am surprised it took Google this long. Google has been warning us that this is coming. I think the biggest surprise was that they announced when the roll out date was. That actually was a good thing because it gave us some extra motivation. Thanks so much for dropping by and joining the conversation. I apologize that it’s taken me so long to reply. I hope you had a wonderful weekend and a great week ahead of you. Sherryl, thank you so much for the mention. Yes, this issue has caused much talk. One of my clients gets a lot of emails like the one you got. Too many people think that is a *good* way to run a business? Boggles the mind. A good responsive theme will take you quite far. 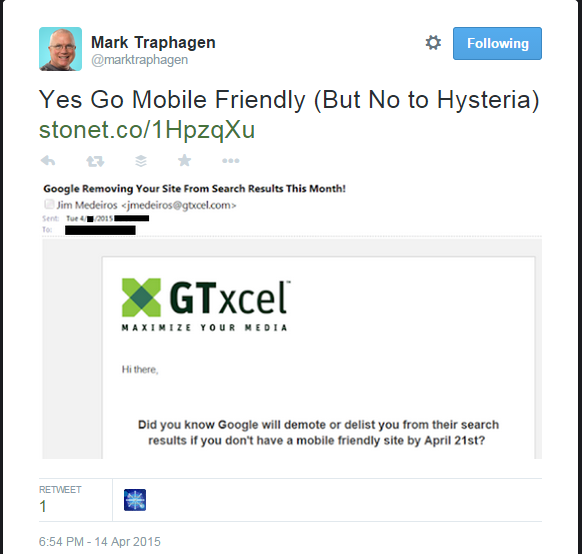 I really value Mark Traphagen’s message on this whole issue: say no to hysteria. You just have to figure out how to solve this one – and have no fear, there will be new issues in the future! Seems to be the nature of anything tech in general. Leora Wenger recently posted..What is a Responsive Theme? Mobile-Friendly Solution? Yikes! I’ve been so busy replying to comments on Adrienne’s guest post that I totally forgot to come back here and reply to these comments. So sorry! I liked Mark Traphagen’s message too. I’m a huge fan of his. I just read a post today by Dr. Peter J. Meyers on MOZ.com called “3 Days After Mobilegeddon: How Far Did the Sky Fall?”. It’s an interesting read. This Google update is still being rolled out but MOZ intends to keep their article updated. So far, IRS.gov with 0.0% of their pages being mobile friendly is at the bottom of the pack. – No surprise there! This is a very interesting topic and in fact I wasn’t aware of it, until just about a week ago. I have a mobile responsive design, but when I checked Google Webmaster Tools I discovered that 51 pages (posts) on my site is not ok with Google and I need to do something about that. But, I won’t be able to get everything done by the 21st. I am paying attention to what Google is doing, but haven’t done much about it yet. Thanks for all the information you provided in the post. It’s detailed and things I had no idea about before I read it. I just knew where to check if my site was ok or not. I think a lot of us are in that same situation. The good news is that your site does show up (on a search from my smartphone) as being “Mobile-friendly”. So, it shouldn’t negatively affect the chances of your showing up in the search results. It may affect the user experience on those 51 pages but you’re in good company not having every page responsive yet. Last month, (when I first wrote about this topic), I mentioned that Rand Fishkin was taking a slow approach to making Moz.com mobile responsive. The good news is that Google has our attention and it is becoming a more pleasant experience reading blogs on mobile. Thanks for weighing in on this. I really enjoy your SlyMarketing.com site. It’s a clean look and you know I’m a fan of your posts. I hope you have a great week ahead. Sherryl Perry recently posted..Are You Ready for the Google Mobile Friendly Algorithm? Glad you got rid of Richard Cummings as a Linkedin connection. What he did is beyond contempt. Unlike you, I’m not technical. As you know, I used WP-touch and, like you, my blog was mobile friendly and not mobile friendly on and off. Tried to figure out how to fix the problems you describe above without having to insert code but that didn’t seem to be possible. So I decided to change to a mobile friendly theme. Had to change the new theme though because the slider was too large to make my blog responsive i.e. it wasn’t possible to see that you had opened another page unless you scrolled down. Then I found one that’s ok and with their support figured out most of the settings necessary. Am still tweaking it and eventually it will be fine. Have to admit that changing to another theme has been really beneficial to my blog. Get much more page views. Have had a page about me on my old themes for at least a year, if not two, but not until I changed theme did a mutual friend of ours read it. The new theme is not only mobile friendly but it’s responsive as well which makes a difference. So all in all, I have to say that Google’s mobile friendly update turned out to be a blessing in disguise for me. Would not have taken the time to change theme otherwise. Catarina recently posted..Could your visual presentations be better? What Richard did was pretty lousy. I hate to think that anyone does business that way. Hopefully, no one fell for it. I think you made the right decision switching themes. I’m glad that you found out that the first theme you tried wasn’t displaying properly and ended up with the one you’re using now. It’s a nice clean look and fits your brand well. That’s great news that you’re getting more page views. I’m glad that Google’s mobile update prompted you to change. I hope you have a great week ahead. Hi Sherryl, Thanks for clearing up this issue. Yes, some people are experiencing panic and calling Google “evil” but let’s face it. In 2015 your website should be mobile-friendly. Period. If it isn’t, Google may not be your concern but your readers should be. If you look at your analytics and see even one mobile visitor, well that’s a visitor you probably disappointed if your site isn’t mobile-friendly. I’m on mobile a lot so this issue is near and dear to my heart as a reader. The solution is pretty easy, I think: just get a mobile-ready, responsive theme. Yes, changing themes can be a pain, but it can also be fun. Give your site a new look and get readers excited about the updated style of your blog. You’re right, you don’t need to spend thousands of dollars for a fix. A new theme should solve most of your issues, if not all of them. So glad you unconnected with the guy who was trying to scam you on LinkedIn. He’s doing more harm than good to his business. Carolyn Nicander Mohr recently posted..Lost Your Android Phone? Find It on Google! That is so true that we should be more concerned about our readers than Google. I’m surprised by how many sites aren’t mobile responsive already. Like you, I view a lot of blogs on mobile and it can be a real pain to not be able to easily read an article. Sometimes, I can expand a post and read it. Then, the share buttons don’t always work properly. That’s a loss for them too if I want to share their content and can’t. Before I could get the WPtouch plugin to work, I viewed my site in the Twenty Fifteen theme and it’s not a bad theme at all. It’s responsive and supported. Using one of the default WordPress themes is definitely a viable option. You know, I resent being openly solicited on LinkedIn. If someone has built a relationship with me and they want to contact me about an opportunity or a possible solution to a problem that I may have, I’m open to a conversation. However, that character had never contacted me prior to this. If I were to invest that sort of money into my business, it wouldn’t be with someone who makes a proposal like that. There were just so many things wrong there. As always, thanks for dropping by and weighing in on the conversation. I always enjoy your blog and find your posts so interesting. I’ll be by soon. I hope you have a great week ahead! Thanks so much for these details Sheryl. Though my site is already mobile friendly, who knows how things change in the future. These are great additions to my toolbox. It’s always nice to see your smiling face here! It will be interesting to see how this pans out. I have to admit that I wasn’t familiar with the term “interstitial” interruption. I certainly see my share of them and Google’s right on this one. They definitely do disturb the user experience. Thanks for dropping by and weighing in on this. I hope you have a wonderful week3nd. Previous post: Are You Confused about Google’s New Ranking Signal?